New Mexico car transport rates can be an arduous task to calculate. The state is the 6th least densely populated and 5th most extensive in terms of size. If the car shipper is not coming or going to Albuquerque, the chances of a fast pickup and delivery go way down. There you go now – we said it upfront. Read on to learn the why of that and what we recommend you do. New Mexico did not get its name from Mexico, but rather, was named by the Spanish in the 16th century after they noticed the Navajo, Apache and Pueblo Indian tribes had many similarities to the Aztec Empire, which so happened to be in Mexico. The Spanish explorers made it part of New Spain. The nation of Mexico actually took over when the Spanish could no longer hold it, but lost it to the United States after the Mexican-American War around 1849. 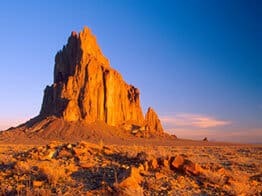 Today the influences of the American Indian and Hispanic cultures dominate the state of New Mexico, giving it a uniquely rich quality that the state is rightly proud. You need a car to see all of New Mexico, just but don’t try shipping one from there. Where Is The Best Place In New Mexico To Ship Your Car? Interstate I-40 cuts straight across the northern section of New Mexico in an east-west direction. It is about 600 miles on I-40 from Amarillo, Texas to Flagstaff, Arizona and we swear the only place in-between is Albuquerque, New Mexico. That’s a long way folks, a lot of cactus and Navajo tacos, which you’ve got to try if ever there. One out of three New Mexicans reside in the greater Albuquerque area, and everybody else is spread far and wide over a great expansive region. The Albuquerque population of over 750,000 makes it ideal for car shipping, and our quote generator returns competitive rates. However, almost everywhere else becomes more costly to ship a car because we must entice a driver to go out of his way, sometimes hundreds of miles, to fetch or deliver a vehicle. Interstate I-25 runs north-south the entire length of New Mexico from nowhere Utah, intersecting Santa Fe and Albuquerque, before culminating hundreds of miles south in Las Cruces, New Mexico, where it marries I-10. Safe to say that even along I-25 it is a long shot shipping a car fast, save Albuquerque and perhaps Santa Fe. It is a beautiful and picturesque highway that does little for car shippers. Interstate I-10 juts up from El Paso, Texas, surprising Las Cruces before making a sharp left turn to the west and traversing hundreds more desert miles before exiting into Arizona. That stretch of I-10 serves to connect the east coast to the west coast, but have no delusions about car shippers loading up anywhere to specifically make a run to southern New Mexico. It’s on the way to someplace else and only if you are lucky will an auto shipper stop to pickup or deliver a vehicle. It is tough, man. Real tough. But you have to choose somebody to transport your car, right? So, why not choose us? We tell you right upfront, right here how hard it is, and we hope you appreciate a straight shooting company. As bad as that is, can you imagine trying to ship a car off the beaten path? Say hundreds of miles from a major highway in places like Roswell, Artesia, Carlsbad or Hobbs? It takes at least several vehicles on a car transport carrier before a driver can hit the road. What is most likely to happen in those places, if it happens at all, is that a car transport carrier just happens to be in that area, and just happens to be going your way, say to Boston or San Francisco, and just happens to have space available. Lord knows we put enough money on it for the carrier because we sure do not want to miss any chances. In other words, you have got to get lucky! We recommend that if at all possible to try to meet a driver in Albuquerque! That beautiful city is the only reliable New Mexico car transport spot. Everywhere else often takes more time. Our innovative first of its kind car shipping quote generator is exceedingly kind to Albuquerque. Please visit Direct Express Auto Transport to fill out a simple form and get a free car shipping quote. We make it easy to book your vehicle shipment online.